Georgia marks the eight anniversary of the death of Zurab Zhvania – father of the modern Georgian Parliament. Dennis Sammut looks back at the life of one of the most outstanding politicians in the Caucasus in modern times. On Sunday, 3rd February Georgia marked the 8th anniversary of the death in mysterious circumstances of Zurab Zhvania, a liberal and progressive politician who is best remembered for his work to establish the Georgian parliament as a credible and model institution, in the mid-1990s. Zhvania started his political career as an environmental activist in the last years of the Soviet Union, and in the years of perestroika set up the Green Party of Georgia which became a focal point for many similarly minded young Georgian intellectuals. In 1992 he was appointed a member of the State Council, a body that had been created after the end of the 1991-2 civil war. Zhvania became an ally of Edward Shevardnadze after the latter returned from Moscow to head the State Council and lead Georgia out of the chaos in which it had found itself. In 1993 he became the head of the Citizens Union of Georgia, a broad based political force which aimed to support Shevardndze’s endeavours for reform and stability. In November 1995 Zhvania was elected Chairman of the Georgian parliament. 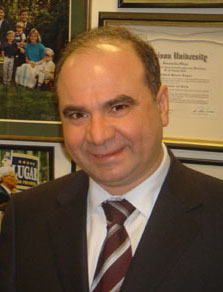 In a very short period of time he managed to introduce a parliamentary tradition in the post-Soviet country, justifiably earning for himself the title of father of the modern Georgian Parliament. He steered Georgia’s membership to the Council of Europe, which it joined in 1999, well ahead of its neighbours Armenia and Azerbaijan. The Georgian Parliament in this period was considered a model not only for other post-Soviet countries but for parliaments in other transition countries far beyond. He was well respected in European and North American political circles, as well as in the region for his visionary ideas that combined with astute pragmatism. His belief in Georgia’s European vocation was never at the exclusion of its Caucasian roots. Zhvania was however well ahead of his times, and in 2001 was forced to resign under pressure from corrupt elements within the Citizens Union and young nationalist elements who considered his path to reform as too slow. The latter formed the nucleus that was later to become the United National Movement. Zhvania was a reluctant participant in the 2003 Rose Revolution. He did not believe in revolution and would have preferred a different approach to bringing change to Georgia. He however risked being completely marginalised, and in the aftermath of the flawed 2003 elections joined forces with Mikheil Saakashvili to bring down the ailing government of Edward Shevardnadze. He was appointed Prime Minister of the new government in 2004. Many looked at him as a restraining force in a government full impulsive and radical members. On 3 February 2005 his body was found in a flat in one of the suburbs of Tbilisi. The official version of events states that he died from a defective electric heater, but many Georgians and others outside refuse to believe this, and claim that he was murdered. Zhvania’s brother Gogla, who is now a Member of Parliament in Bidhzina Ivanishvili’s Georgian Dream coalition has led an effort to re-open the investigation. The coalition is committed to a full review of the case, and the process is currently on going. Prime Minister Ivanishvili in a statement on the anniversary of Zhvania’s death described it as a great loss for the young Georgian democracy and promised to give his family and Georgian society the truth about the case. Many feel that it is necessary to bring this matter to a closure, so that in future the anniversary will no longer be an occasion for speculation about the circumstances of Zurab Zhvania’s death, but will become an opportunity to celebrate the life of one of the most outstanding Georgian and Caucasian politicians of modern times.